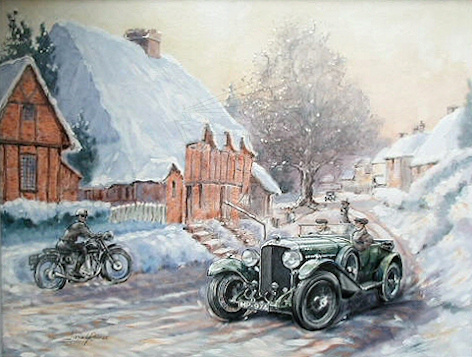 H Lionel Rouse was probably an amateur artist all his life but was most active after retirement. His range of paintings included maritime, still life, topographical and London street scenes. 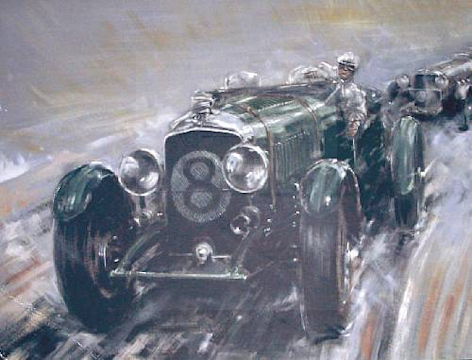 He obviously had a strong interest in motoring and produced excellent paintings of motor racing. 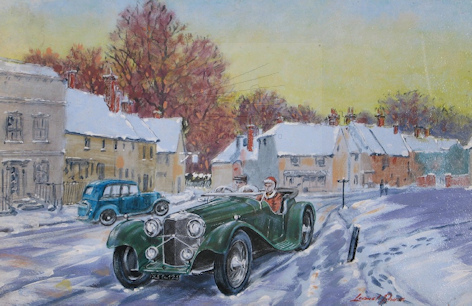 Several of his paintings were used by greetings card manufacturers and at least two of his paintings were used by BEN (automotive industry employees’ charity) for a Christmas card. Lionel Rouse was born in 1911 and brought up in the Coldharbour Lane area of Balham/Brixton where the family lived and traded as auctioneers, furniture, antique and art dealers. There is a false birth/death date in existence, as back in October 2005 there was a sale by Woolley & Wallis of 38 of his paintings consigned his daughter. 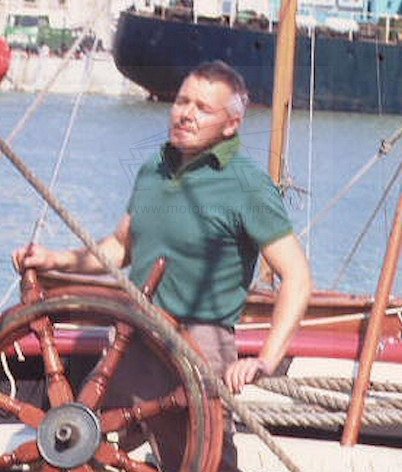 The dates quoted in the sale catalogue were (1913 – 1986), how this discrepancy has arisen has not been determined but the dates (1911 – 1984) are correct. There were artists in the family, his uncle was R W (Robert William) Arthur Rouse was born in 1867 and was a celebrated English landscape painter. He was a member of the Royal Society of British Artists from 1889 until his death in 1952. His works are often seen for sale in the auction houses in England. He exhibited at the Royal Academy and several other places, as well as doing book illustrations. This uncle and father were part of a family of ten boys and two girls. Another brother Frederick born 1869 was also an artist who exhibited at the Royal Academy. Also Eugene born 1874 is known to have painted portraits and landscapes. So the young Lionel would have had plenty of family encouragement from his uncles for his early artistic endeavours and he possibly attended the Lambeth School of Art. However, in working life he was a Design Engineer. He married Winifred Iris Chew in 1934, she was always known as Iris. She was 3 years younger than him and was a childhood star of Silent Movies. Her stage name was Bunty Fosse. They had three daughters. He died in 1984 of lung cancer, his wife died a month later. 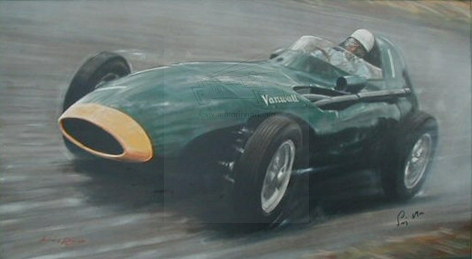 Lionel’s art was normally acrylic paint on board, painted at a fairly large size (typically 900 x 600 mm). The paintings are normally very bright, fresh, with lots of colour. 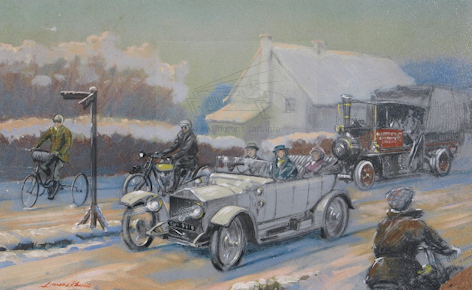 Although his motoring paintings were only a small proportion of his output they are of very good quality and sell for four figure sums when they appear in auction. Thanks to Michael Rouse for assistance with the above information. 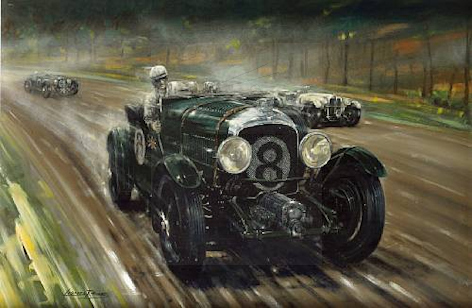 Bentley v Mercedes at the 1930 Le Mans Race. 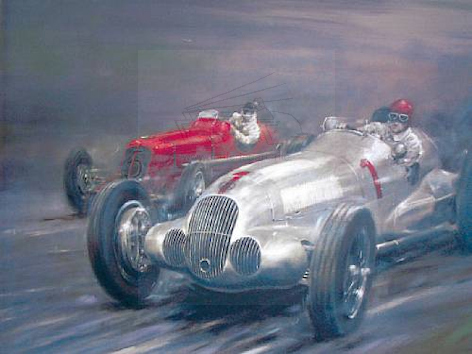 Image courtesy of Bonhams auctions.